Salutations! 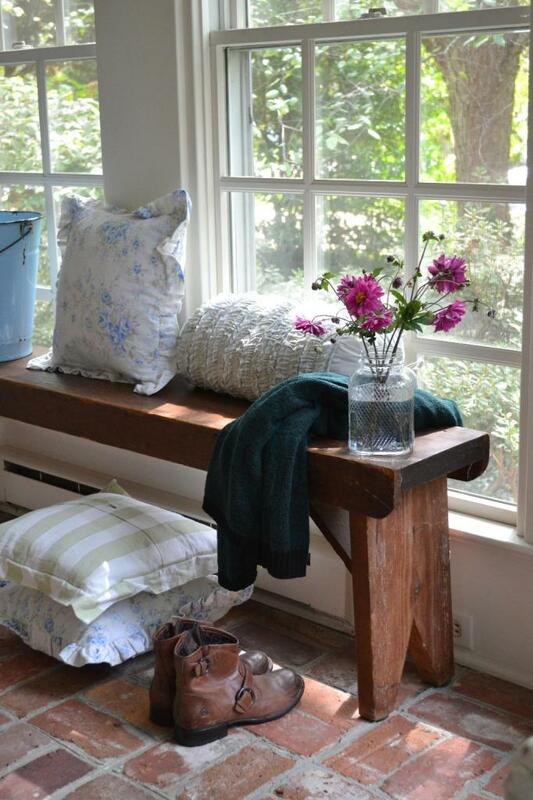 How about a bouquet of bright pink blooms and an heirloom bench for a shot of shabby vintage style on the sun porch? 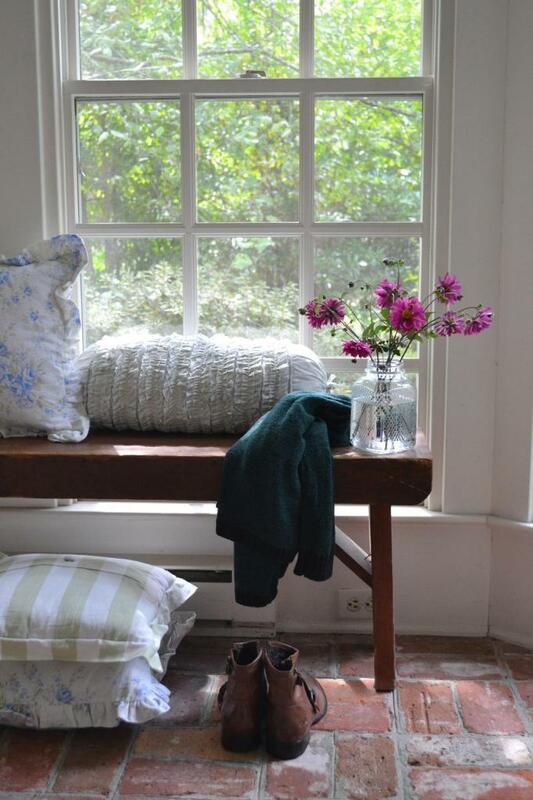 It’s a rustic pine bench hand-built by my great grandpa Tipton; how funny that here she is all these years later adding a dose of charm to our sun porch for fall. I foofed this vintage beauty with a few shabby chic pillows to soften her up and add a little color. I hope she’s an admirer of soft blue florals and cabana stripes like I happen to be. I’m not sure what these bright pink daisy shaped blooms are, but I’m feeling quite lucky to have a little something blooming in the back garden — not much in bloom around town that I’ve seen. 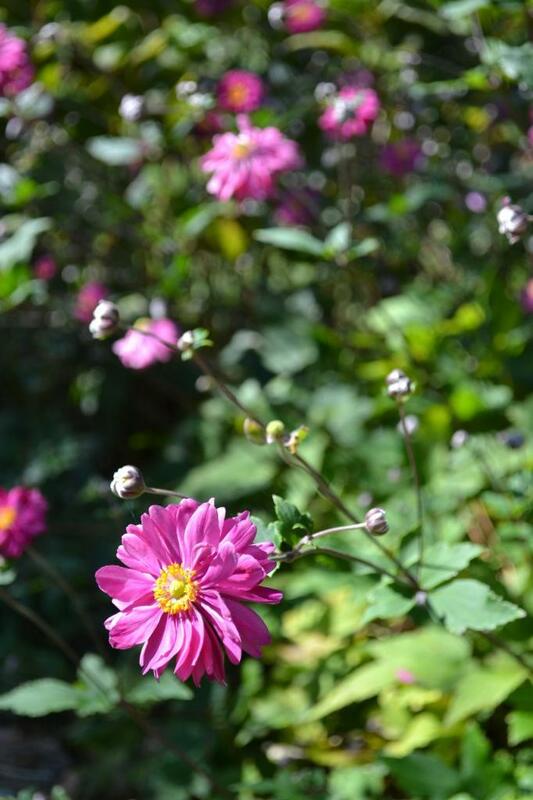 They make their entrance in late summer and stick around through early fall and spread easily. They’re always a nice little treat after the garden is on its way out. And that color, oh yeah, I’ll take a bouquet of hot pink happy please! 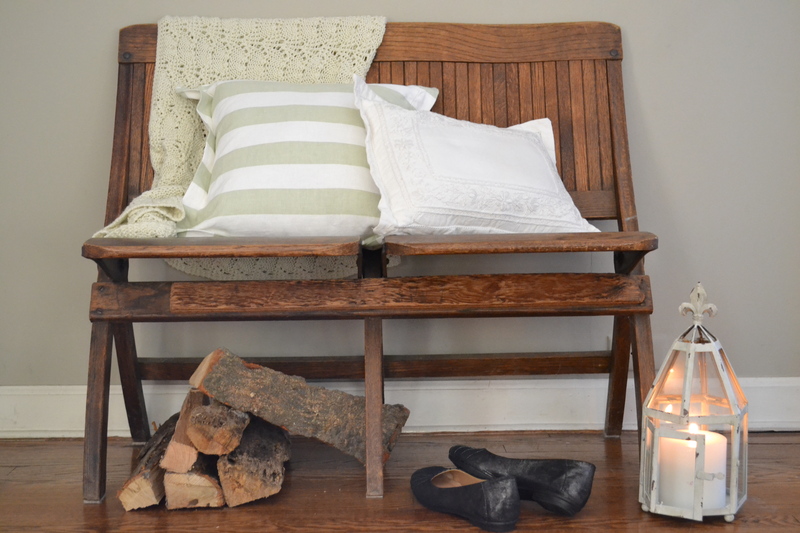 Nothing says fall like an ivory knit throw all nestled up waiting for a snuggle. 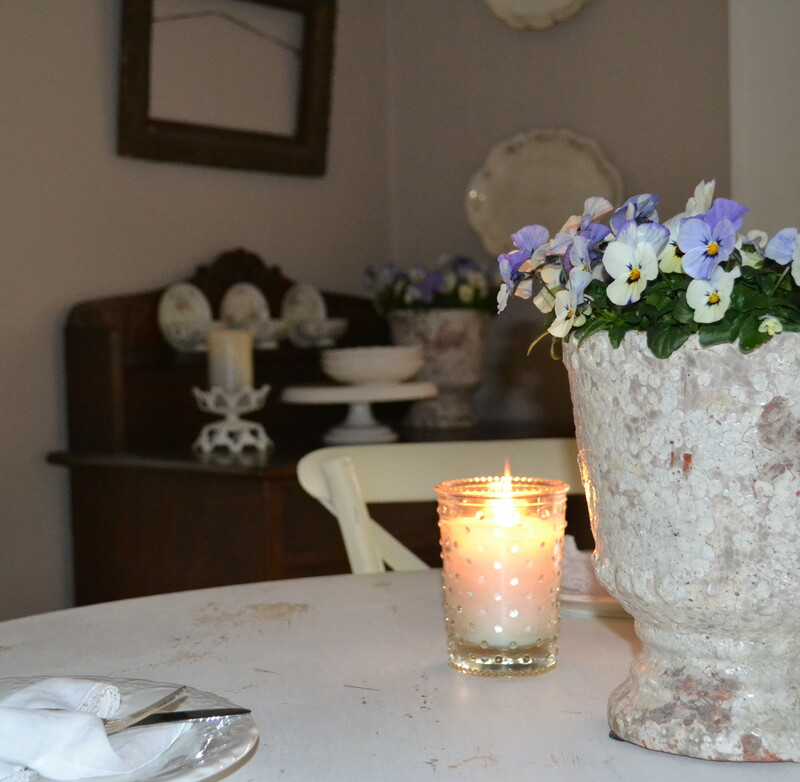 These have found a place all over the cottage softening things up and adding a touch of cozy comfort. And ivory is so easy to bring in to just about any color pallet. 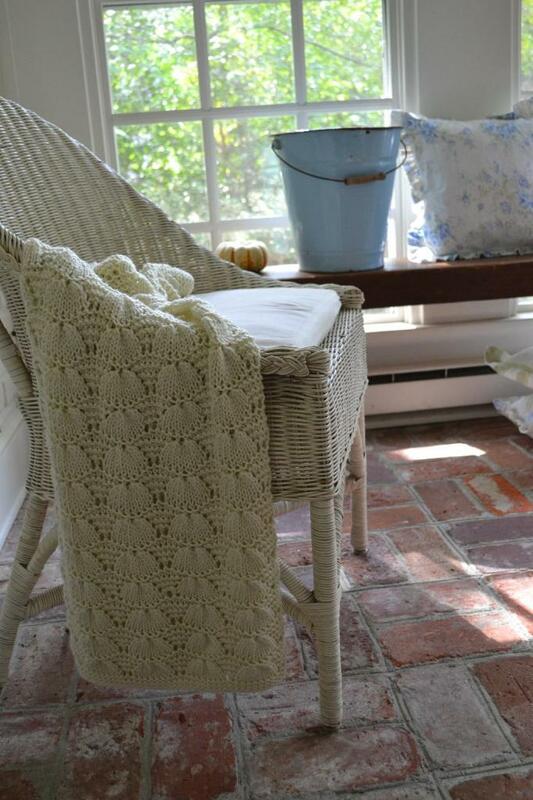 So I chucked this little sweetie on the wicker to make a rather summery chair feel a little more like fall. My honey keeps joking with me that it looks like we’ve been robbed on the sun porch. It was getting dreadfully bare at one point — Is that an invitation to go shopping dear? All jokes aside, I have something in the works that involves wrought iron and matelassé and I think the bench is also really helping. Especially since I filled every square inch with chachkies! This entry was posted in seasonal decor and tagged fall, flowers, furniture, garden, pillows, shabby chic, vintage on September 20, 2014 by sally. Love that bench…it must mean so much to you! and the way this space is styled is just fantastic! That bench looks great there, Sally. 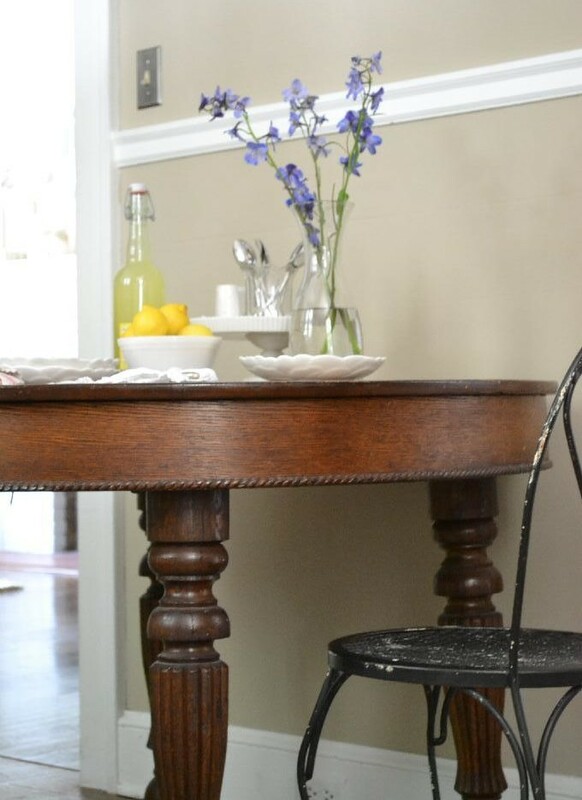 But seriously, every time I see your floor and painted brick wall, I die a little 😉 My sunporch would have those in my dreams…. What a lovely treasure to have handed down from previous generations. 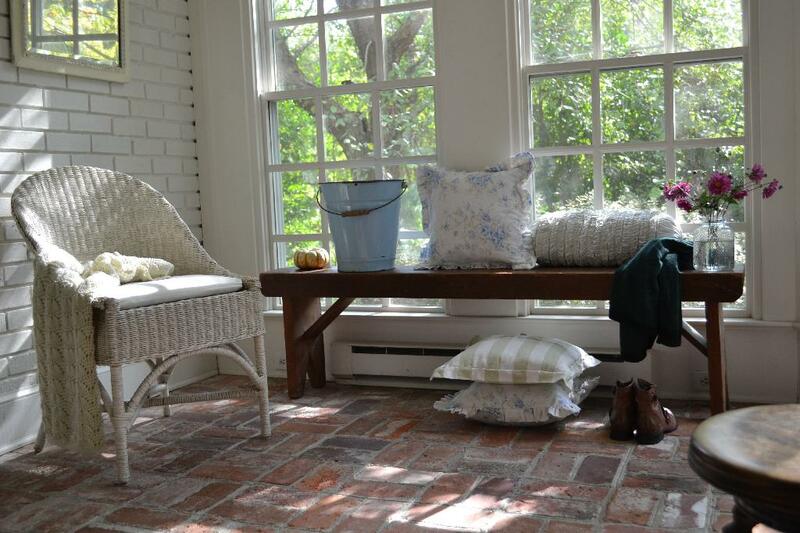 The bench looks great in your sunroom, and I love how you’ve softened it with your pretty pillows! I love your porch and your pictures are amazing! So glad to have found your blog thru Mary Alice. Thank you for joining us for the Falling For Fall Porch Party! 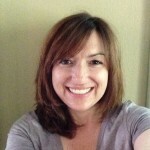 hi there- new follower to be – found you over at My Front Porch… xo, laura pretty room. Hi Laura!Thanks so much for popping over and welcome! 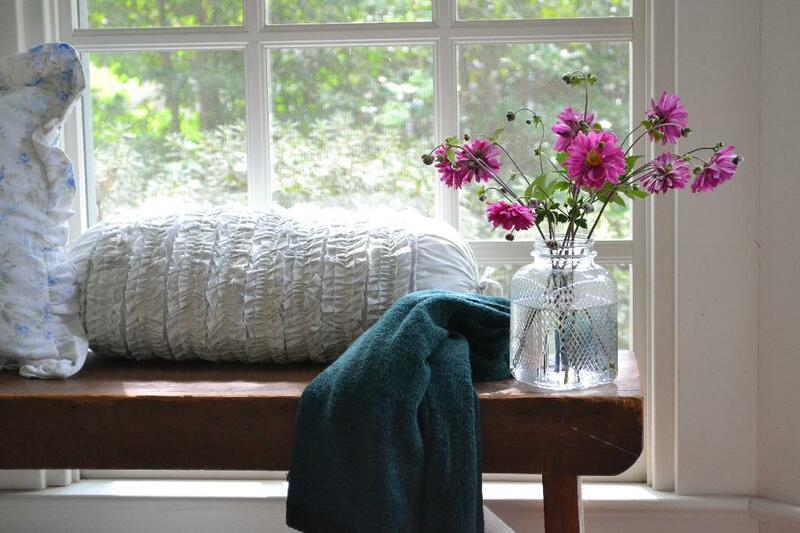 I like the little fall accents you have added to your sun porch. I can’t wait to see what you add to it in the future! Oh yes! I think you should milk this for all it’s worth and go on a shoppng spree for the porch! LOL! You can say it was your husbands idea, right? Looking forward to seeing what you end up doing out there. Hi Karin! Thanks so much for the sweet comment! I just linked up to Centerpiece Wednesday.